Cannon Beach used to be a twice-a-year jaunt for us. We’ve probably traveled here more than any single place on earth, although the number of visits we’ve made to Venezia is closing in on comparable. We came here with our collie each spring and fall for years and the first-night supper was always take-out pizza from Fultano’s. 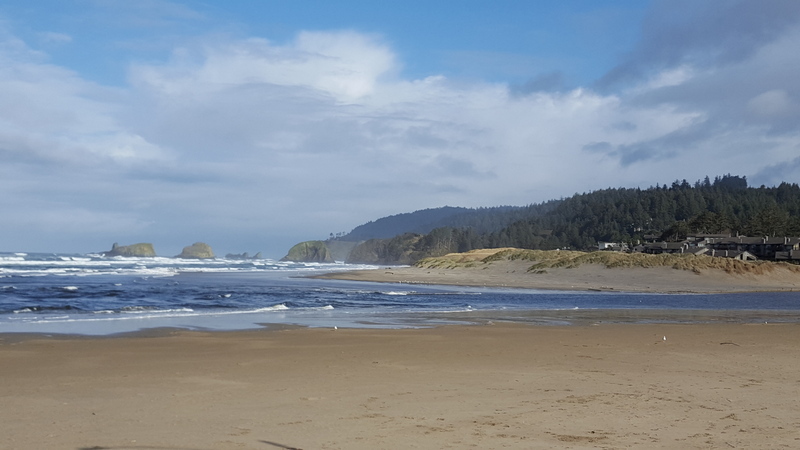 A rare sunny moment on the beach this week with a view to Tillamook Head. Our stint in Italy made Cannon Beach a long commute, so we haven’t been here since 2011. We’ve found much has stayed the same but there have also been changes. A new high-end grocery store, Fresh Foods, is a fine alternative to the old and musty Mariner Market. There are fun new restaurants such as the Cannon Beach Hardware and Public House, AKA “Screw and Brew,” while old favorites like Bill’s Tavern and Sleepy Monk Coffee endure. Luckily, Fultano’s is also still here. Even after almost five years of pizza degustazione in Italy, Fultano’s was a nice surprise. Not as good as Hearth and Table, and certainly not as good as our faves in Roma, but an enjoyable American-style pizza. The interior is built for large groups. A party of eight had just vacated the table in front of us. Order and pay at the counter. 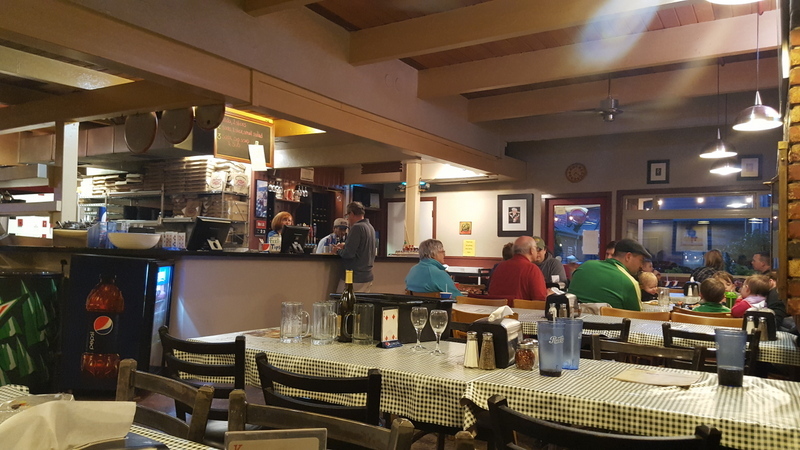 The ambiance is not much, but then we’ve been in pizzerias in Italy that lacked atmosphere, too. (Not every Italian eatery is charming.) The people are very nice, and on this cold, blustery, March evening it was bustling with two family groups of eight people, a pair of couples, and several people stopped in for to-go orders. Fultano’s abundant Haystack Pizza. A little-bit-of-everything…. 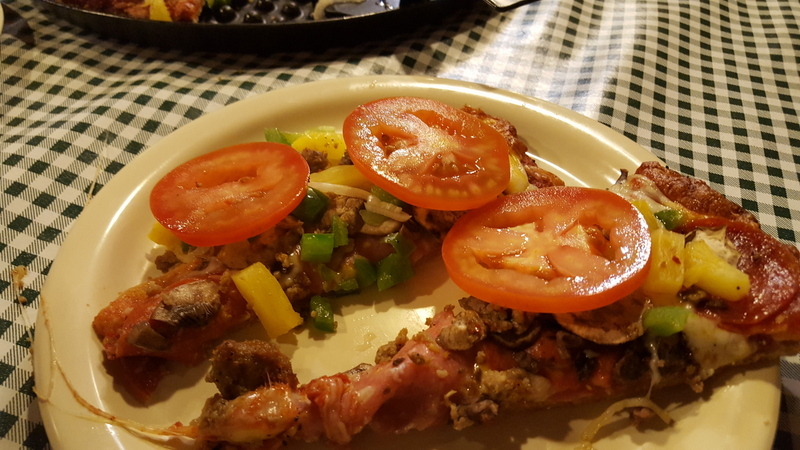 Our favorite pizza at Fultano’s is very non-Italian: the overloaded “Haystack” pizza. Cannon Beach is famous for Haystack Rock and this pizza is piled high with ingredients, thus the name. 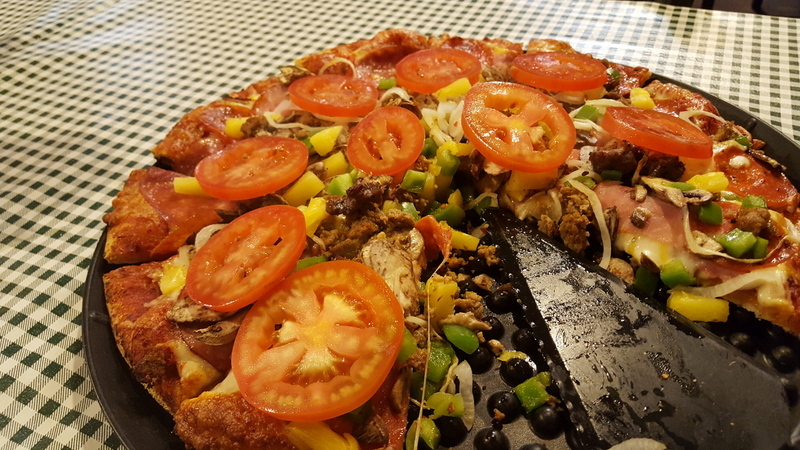 It includes Salami, Canadian bacon, pepperoni, Italian sausage, seasoned ground beef, onions, mushrooms, green peppers, olives, pineapple and Roma tomatoes. At $26.00 for a medium, it is far more expensive than two individual pizzas in Rome at our favorite places. Luckily, we could only eat half (unlike in Italy) so we had it for lunch the next day. 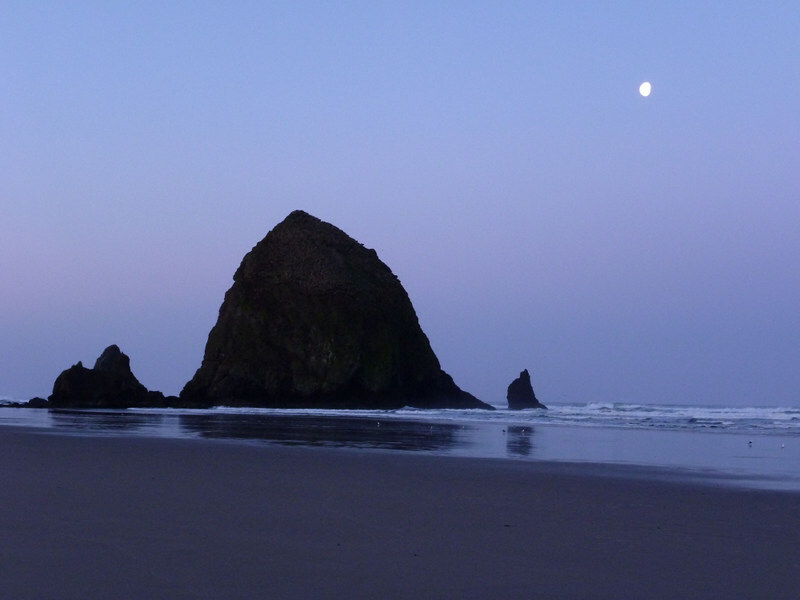 This is iconic Haystack Rock at Cannon Beach. Fultano’s pizza crust is dusted in cornmeal. While not particularly thick, the crust is substantial and the cornmeal makes it stand up to the pile of ingredients. Even overnight the use-ups did not get soggy. Their sausage is particularly flavorful, the peppers and onions come out a bit al dente, and the tomatoes are added fresh after baking. So you might ask why, if we live in Lincoln City on the Oregon Coast, we traveled to Cannon Beach. It is too far to drive just for pizza at two hours door-to-door. We came on a nostalgia trip and to celebrate Ric’s birthday. We have a nice ocean-front room and are living dangerously in the tsunami zone for three nights. (At home, we are safely away from the wave action.) It’s always nice to go back to a favorite haunt. Since we can’t get to Venice in 3 hours anymore, we’ll pop up to Cannon Bach now-and-again. Pizza Quality: 2 Fresh ingredients, very tasty, but the crust and lack of wood-fired oven mean an OWP “3” is out-of-reach for Fultano’s. Pre-sliced, of course, like most American pizza. Service: 2 Order at the counter from the nice woman and they’ll call you when it’s ready. Ambiance: 2 Long communal tables, great for big groups, but not date-night charming. At least kids were not running amok like they do at Gallucci’s. Bonus: 1 Extra credit for good wine and beer choices. Oregon wines and on-tap regional beers. Yes, I am afraid so. I’d never ask for it nor eat it in Italy, but here, it works. Our sonàs favorite pizza is sausage, onion, and pineapple. It’s pretty good…in America.